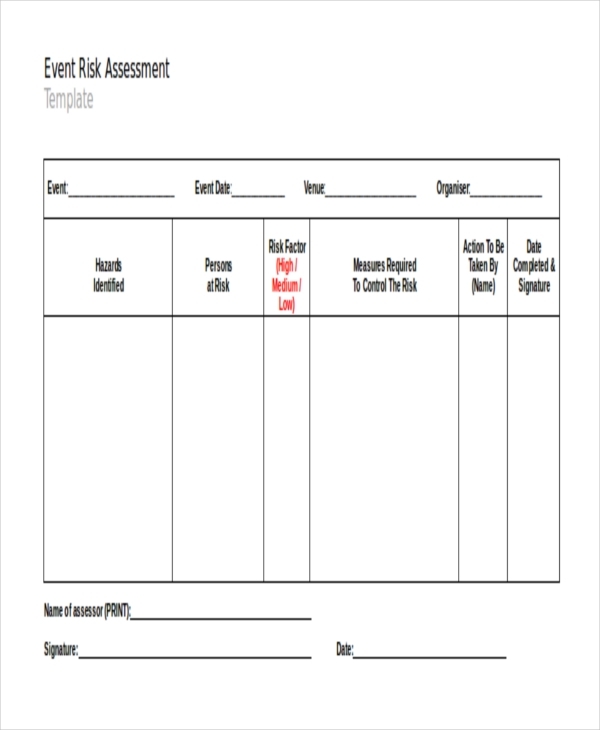 A Risk Assessment Form is used to assess the risk involved in a particular event or circumstance. It comprises of a number of subheads which the person assessing the situation needs to fill in based on his findings. A risk assessment form helps in analyzing the risks involved in any given situation and since the information is written in an organized manner, it becomes easier for the authorities who concerned to take necessary steps to reduce risk. 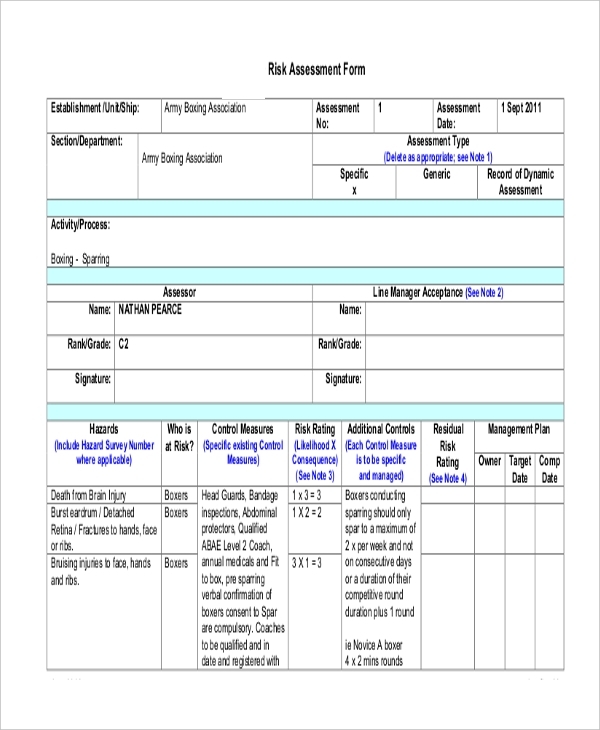 This is risk assessment example form and can be used by anyone to assess risks. It comprises of all the important segments that should be part of such a form. The user can use this form just the way it is or make changes to it. 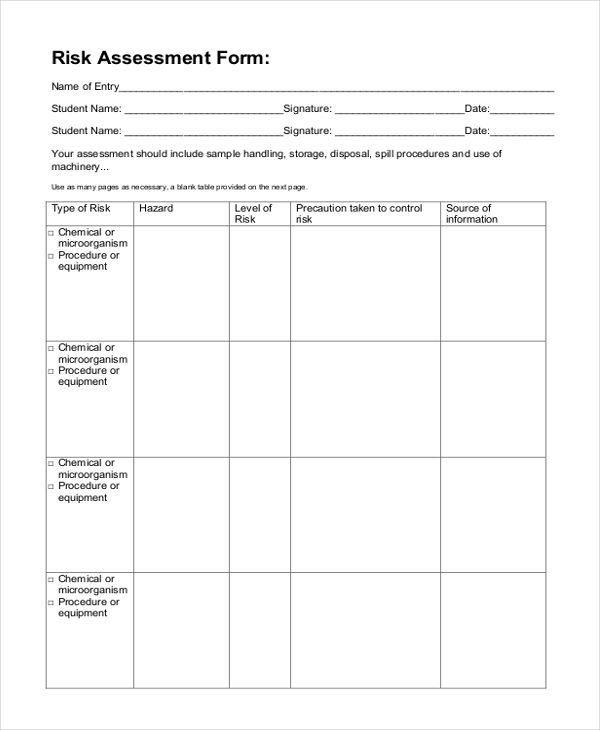 This form is generally used by the government official to analyze the possible hazards that a chemical factory can have on the environs. The official is required to fill his findings in details in the predestined segments of the form. As the name indicates, this form is used by an official analyzing the electrical wiring and other electrical components in a factory. Based on the details filled in the assessment form, the higher officials grant permission to the company. 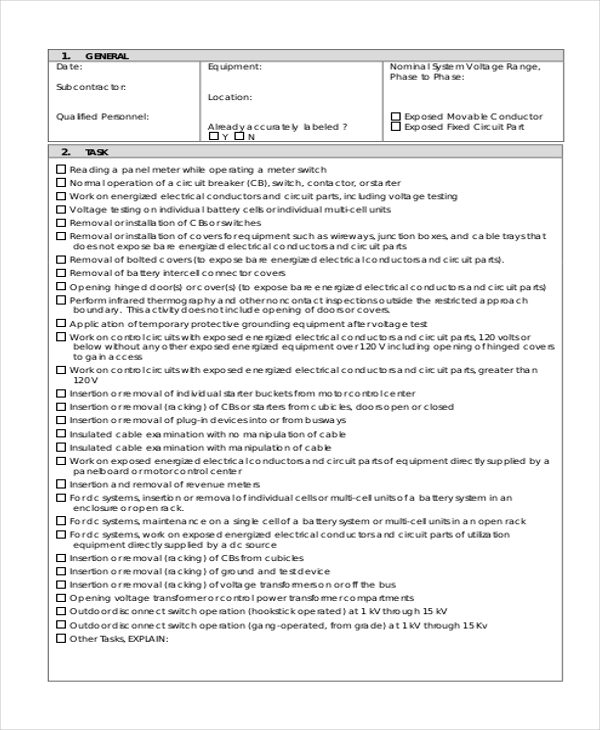 Used by an official who might have been hired to check the environmental risks of a given project or event, this form comprises of important segments which the official needs to check. 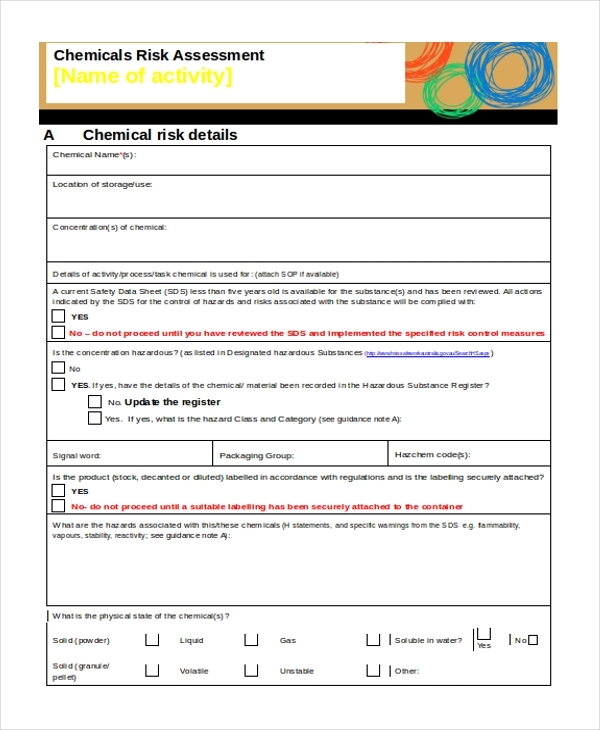 An event risk assessment form is one that is used by an official who may have been hired to check the various hazards that could mar a given event. The official should fill in the form with his findings and submit it to the authority concerned. 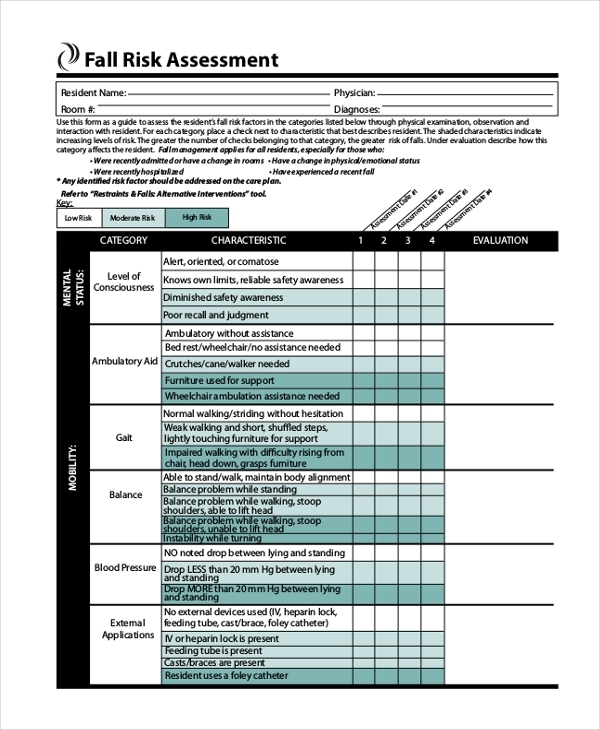 This form is usually used by hospitals and medical care units to analyze the fall risks of a patient. The official studying the patient is required to check the various parameters to analyze the extent of risk. This is a standard risk analysis example form and comprises of all the important segments that should be included in such a form. The user can use the form as it is or make necessary changes to it. Before a person is granted the permission to start a gym he is required to get the premises assessed for any possible hazards or risks. 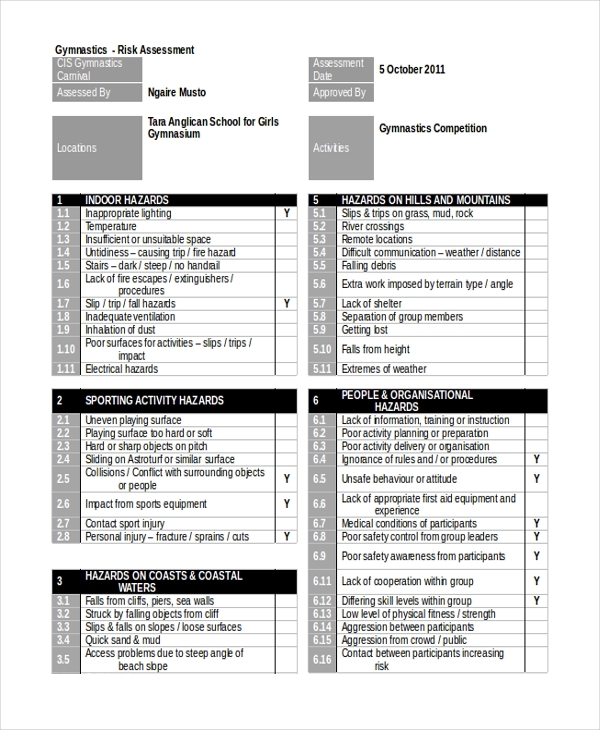 It is in these circumstances that a gym risk assessment form is used. 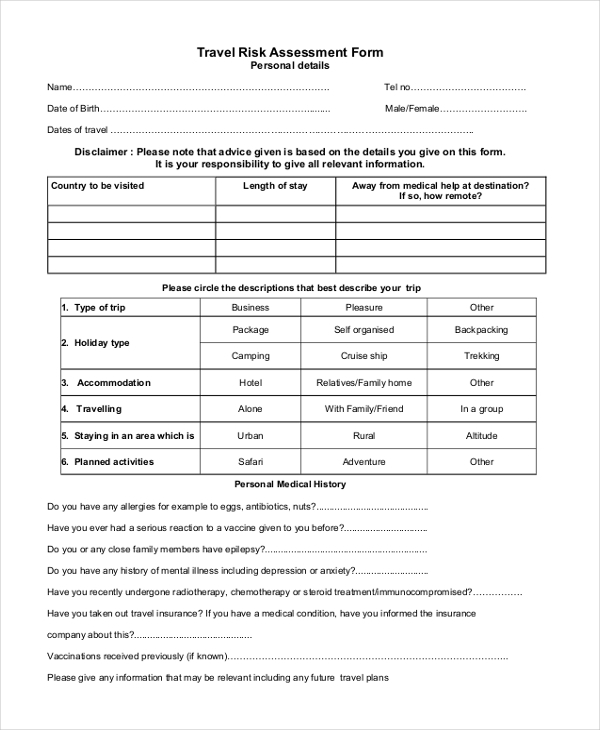 This form is usually used by a medical facility or medical camp organizers to analyze the health conditions of the people. On the basis of the answers that a person gives for the queries, the doctors can assess the risks to his health. 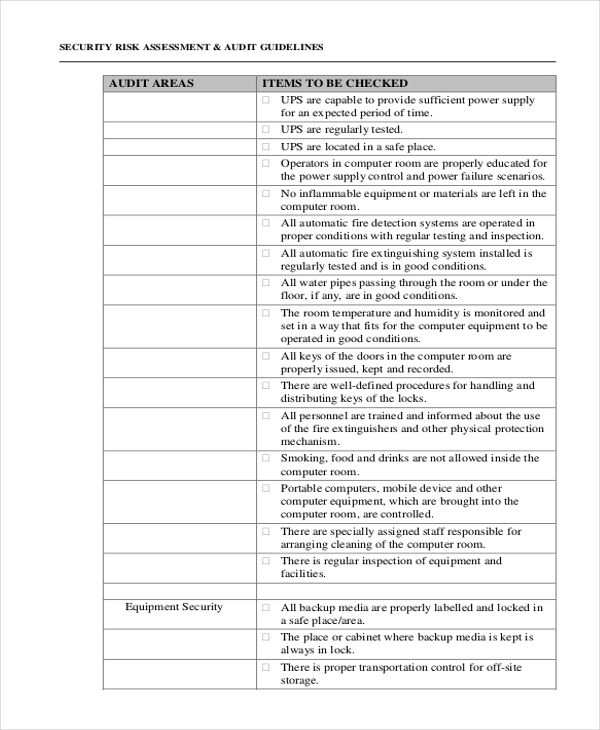 This is a risk assessment form that is used by an official who may be analyzing the possible hazards of a given job. Mainly related to machinery, this form comprises of all the important parameters that the official needs to check. 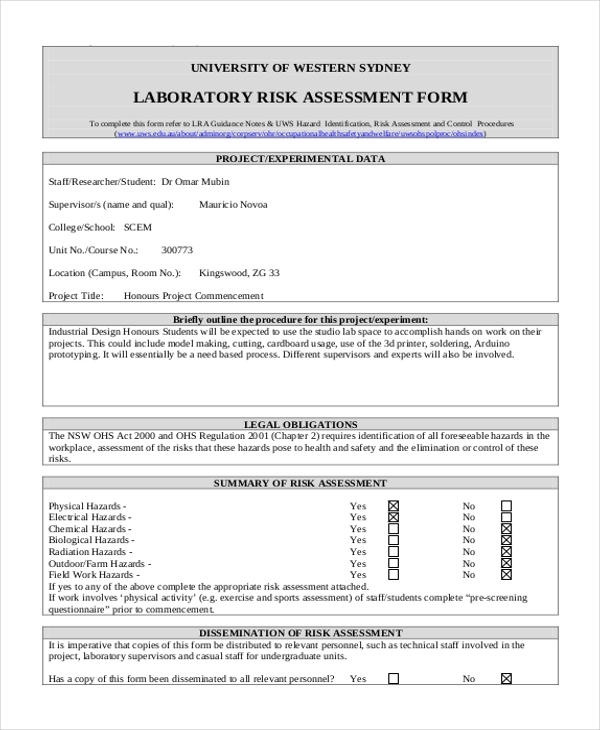 An official who may be assessing a laboratory and its premises is required to fill in a laboratory risk assessment forms with all the necessary details. He needs to check all the crucial parameters and then fill up the form accordingly. Before granting permission to start an office, the government may ask one of its officials to check the premises to ensure that all the possible risks have been addressed. 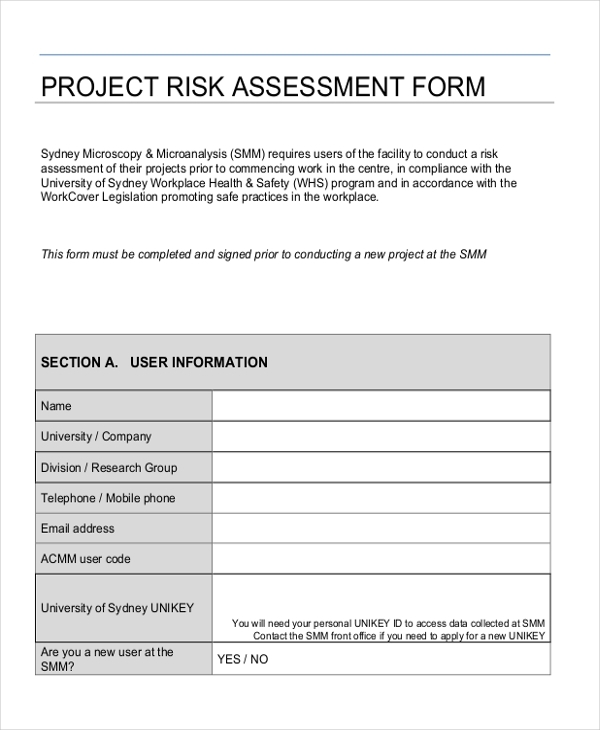 It is for this purpose that an office risk assessment form is used. 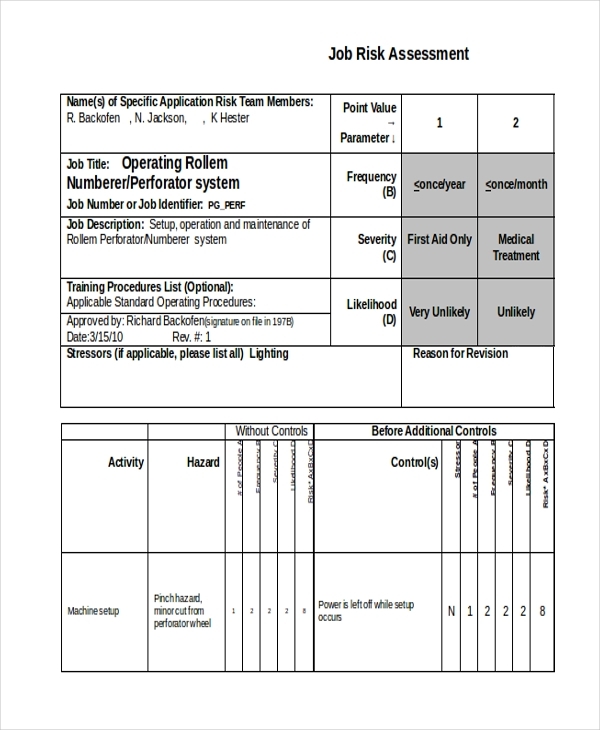 This form is used by an official who may have been assigned the task of checking the possible hazards of a project before it goes underway. The official needs to check all the parameters that could be hazardous and report his findings in the form. 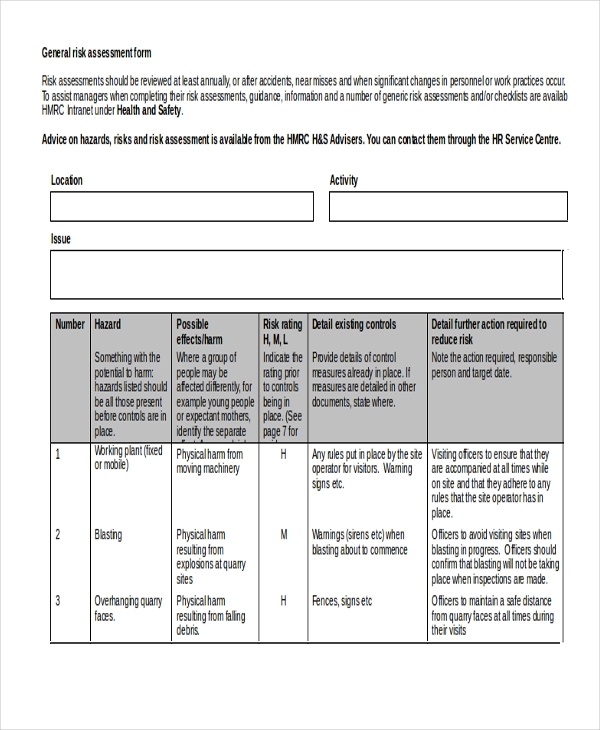 As the name suggests, a safety risk assessment form is one that is used by a person checking the safety measures of a given place or event. He fills the form with the details of the safety parameters and possible changes. Predominantly used in the IT sector, this form comes in handy when analyzing the security features of a new project. The person checking the project needs to fill the form with details of security features and any possible risks to it. This form is mainly used by travel agents or travel consultants to help their patrons choose a trip that would be best suited to them. The patrons are required to fill in this form with necessary details and the consultant would then advise them based on this information. 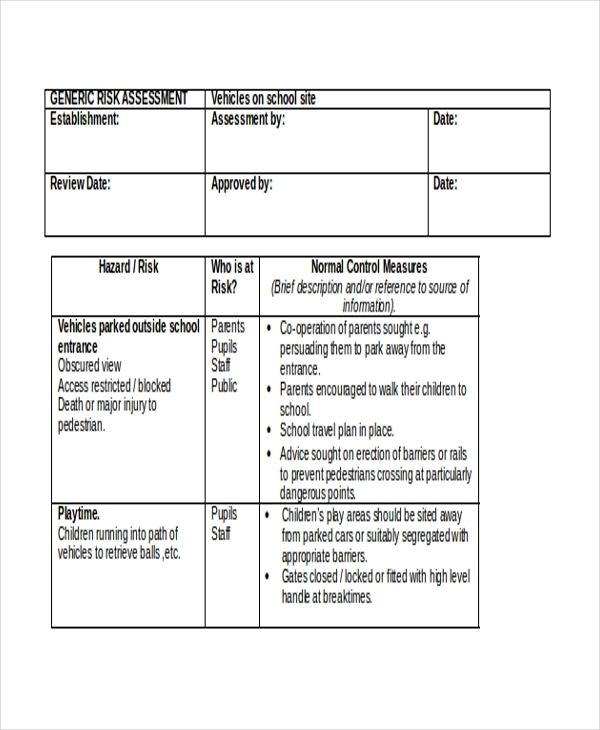 This form is mainly used by schools and other organizations which need to analyze the risks that vehicles could cause to their patrons. The person assessing the situation is required to make an analysis based on the parameters mentioned in the form. 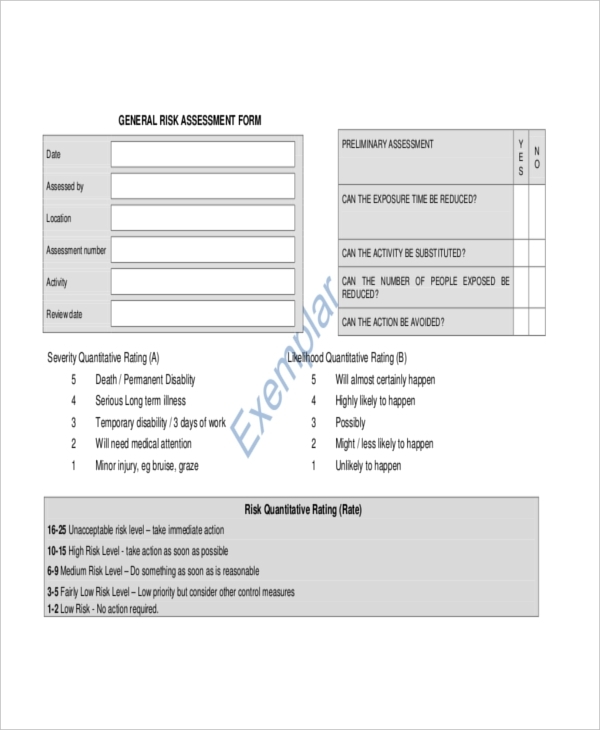 As the name indicates, this is a risk assessment form that is used by the army to analyze the risk in any given situation. The official assessing the risk is required to fill in the details in predefined areas before submitting it to higher officials. Risk assessment has become a norm these days and a must for companies that may need government sanction to commence their operations. 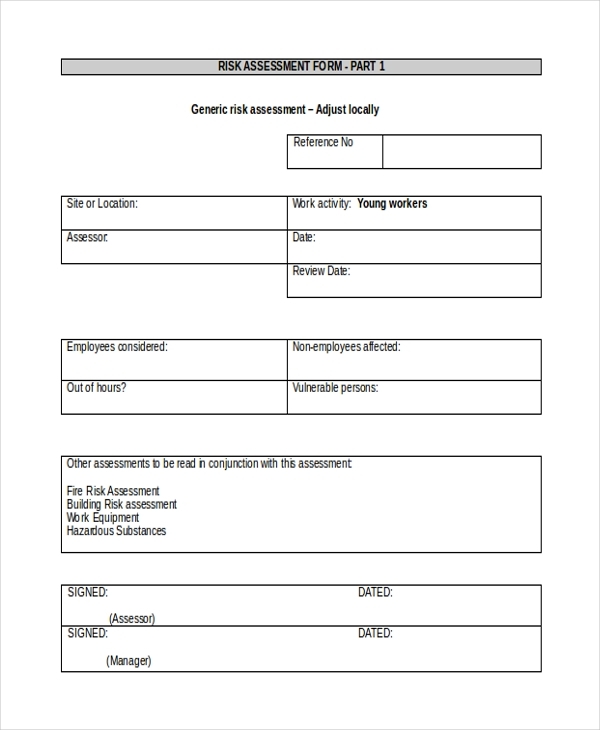 Thus, risk assessment form can be used by anyone who may be working in a responsible position and is assigned to analyzing risks in any given situation. Government offices use risk assessment form to ensure that a given project/factory has followed all safety norms and can be issued a license. Hospitals/Medical Facilities use a risk assessment form to make sure that their patients’ health does not face any immediate risk. Event Managers can use a risk assessment form to analyze the possible hazards of conducting an event in a given venue and to come up with solutions for these. 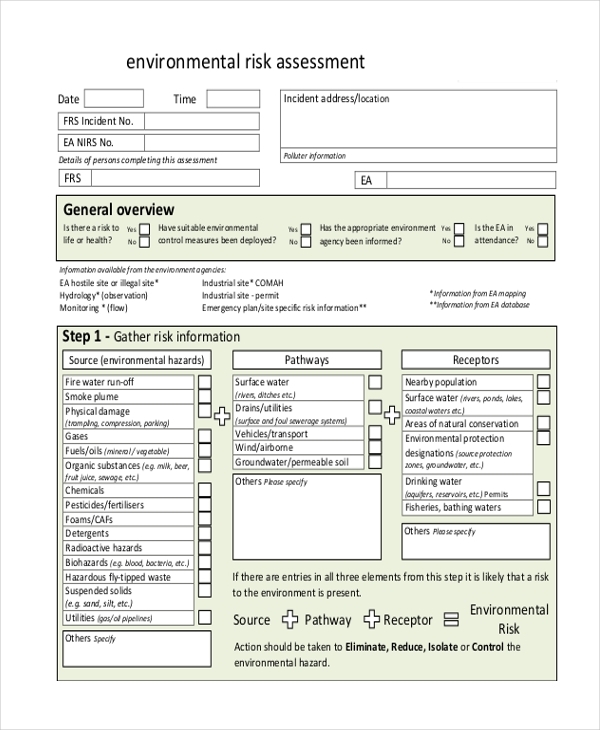 What are the Benefits of Using a Risk Assessment Form? A risk assessment form can simplify the whole risk analysis process and thus comes in handy in such situations. 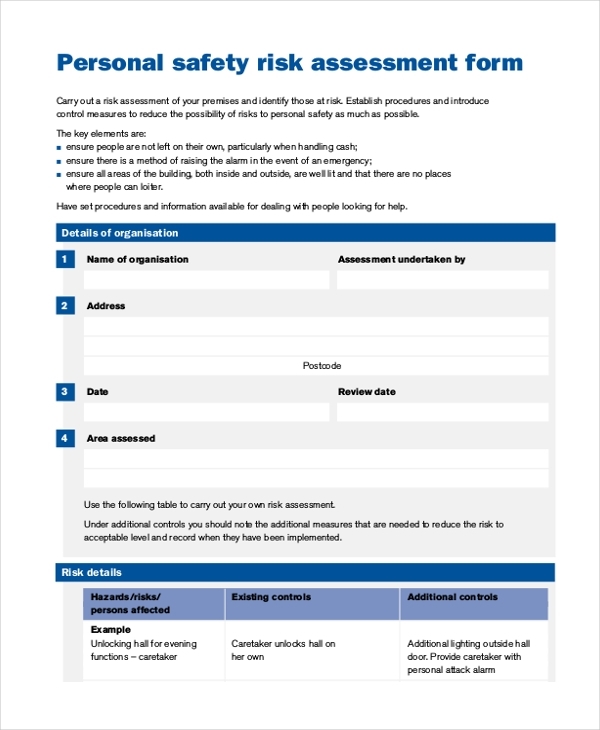 In case, you need some help to design a risk assessment form, check out our collection of risk assessment forms and choose the one that is apt for you. 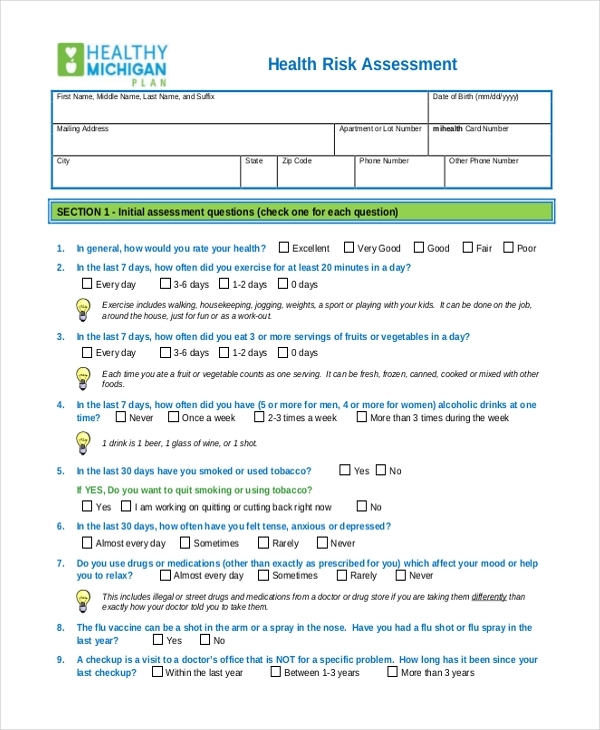 These forms are easy to download and customize.